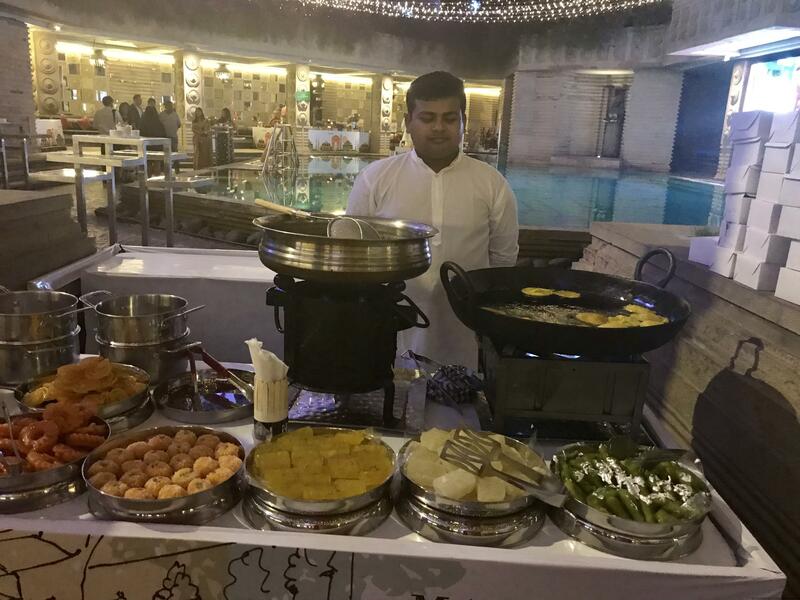 In the maze of food promotion invites, which come my way with alarming frequency these days from star hotels and standalone restaurants, I feel much enthused to blog on a few which surpass their promise. 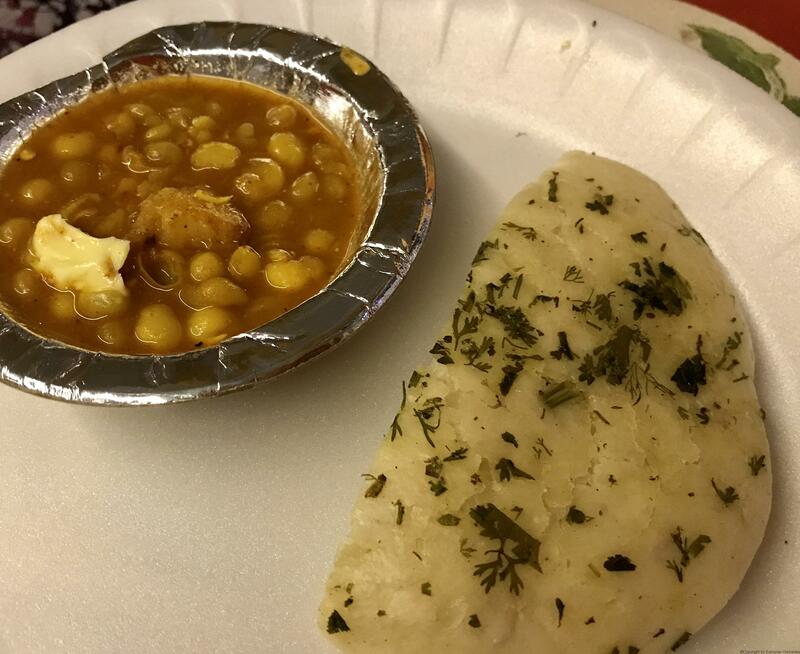 One such recent experience was ‘Along the NH2 trail’, which showcased not just cuisines but also local hotspots folk-lore kind dishes, of cities which fall on the National Highway 2 connecting Delhi to Kolkata. 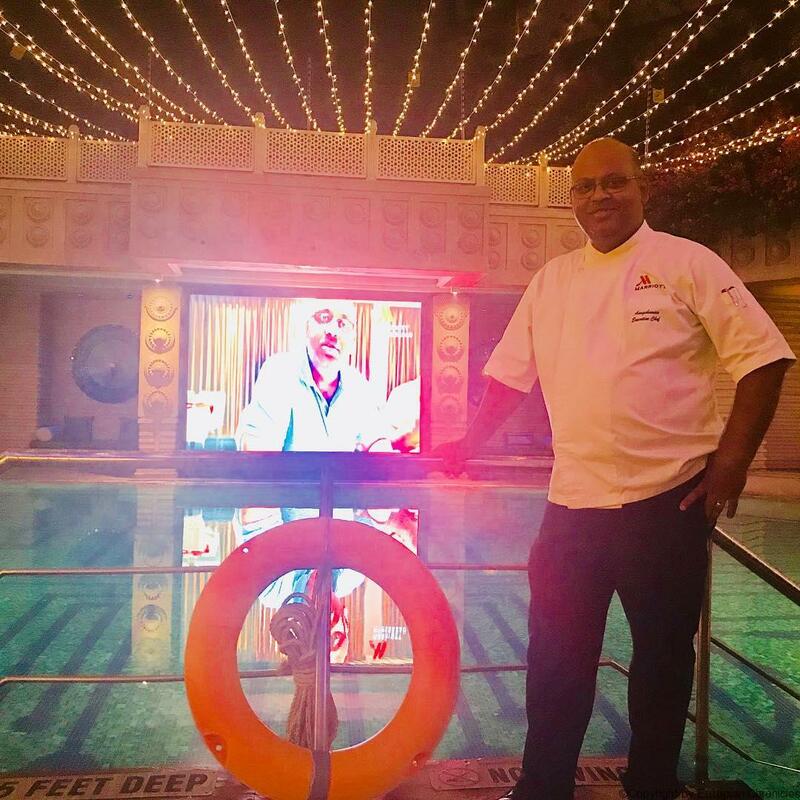 Aungshuman Chakraborty, Executive chef of Marriott Hyderabad along with the F&B director Jomy Abraham and other team members embarked on a ten-day road trip along the highway, trying out all the popular eateries and dishes. And the effort showed in both its magnitude and accent on perfection. 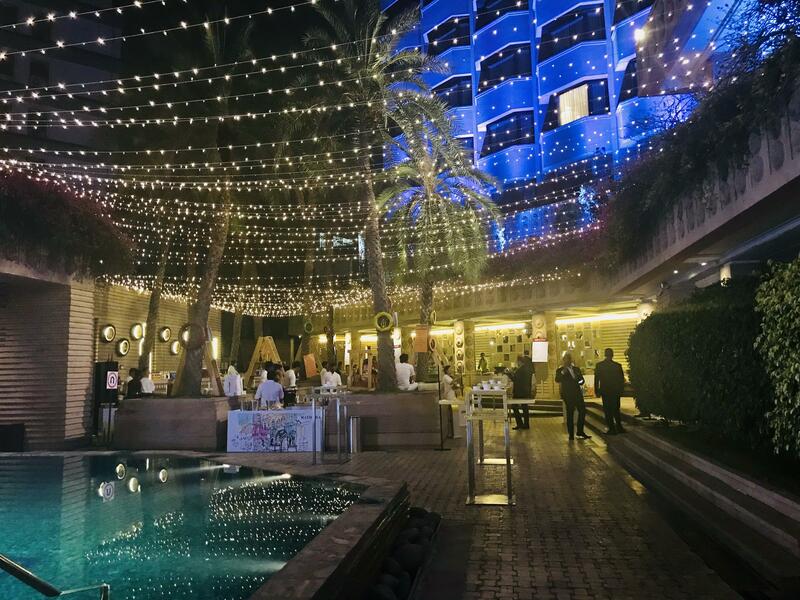 One of the most charming aspects of the promotion was the venue, the poolside at Okra and right under the skies, with a live bar and several live counters, including a barbecue and grills for some Rajinder da Dhaba inspired Tandoori chicken and the works. So be it the famous Kulcha Chole, Paraathe Walli Gali of Chandni Chowk and Old Delhi, Agra Moth and Petha, Benares’s lassi, Chelo Kebabs inspired by those of Peter Cat in Kolkata, Tangra Chinese (from Chinatown, Kolkata), Mamra Mutton from Dhanbad, and Chicken Stew or Aloo Keema Mutter Karim’s from Delhi, these delights from NH2 were all here at the Okra pookside under the glittering stars and skies! 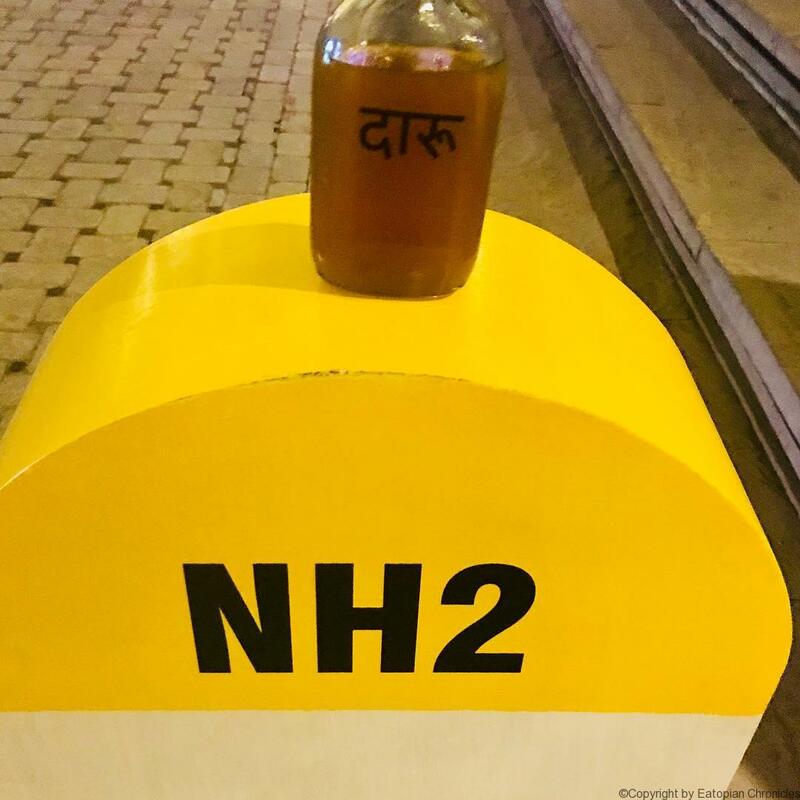 The drinks were also innovatively designed after street food sensibilities and names and one such popular one was Daaru, a simple rum and jaggery concoction presented in an antiseptic solution bottle! Daaru, a rum and jaggery concoction..
My first stop was at the counter for Chelo Kebabs inspired by the dish from popular eatery Peter Cat of Kolkata. 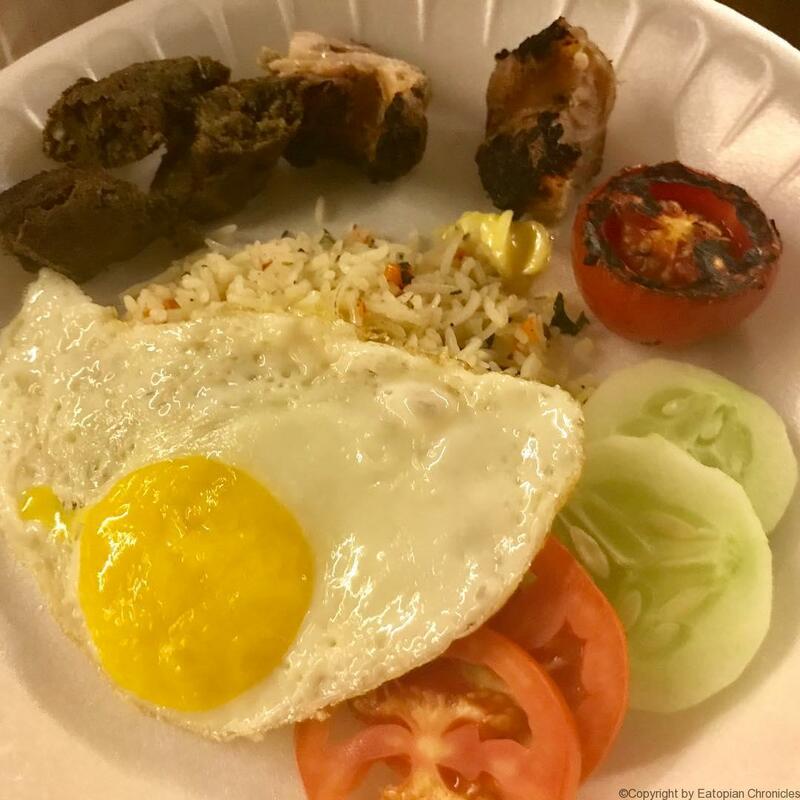 Iranian of origin, Chelo kebabs platter comprises of grilled lamb kebabs and rice cooked with butter and salt, with a fried egg as garnish. 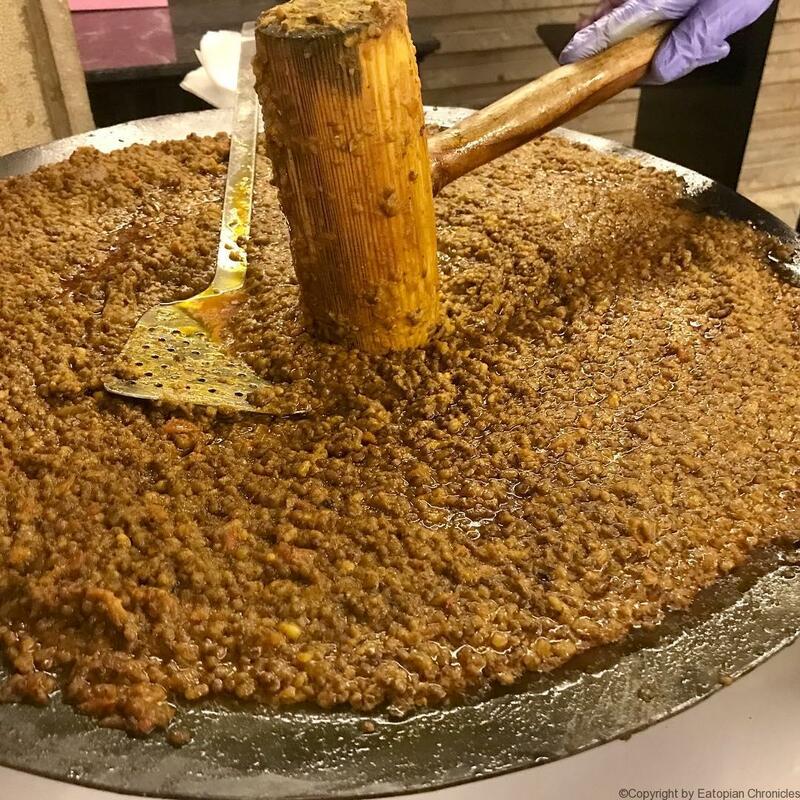 “Iran’s version of Nasi Goreng, if you please,” smiles chef Chakraborty. I find the kebabs delectably smoky and the rice makes for a good munch, a one-pot-meal at its best! My next stop is at the Bihaari Ki Dukaan for a bite of Mutton Mamra, a spicy bhel puri of mutton cubes cooked in a dry, spicy masala. Quite a palate pleaser and a rare dish! 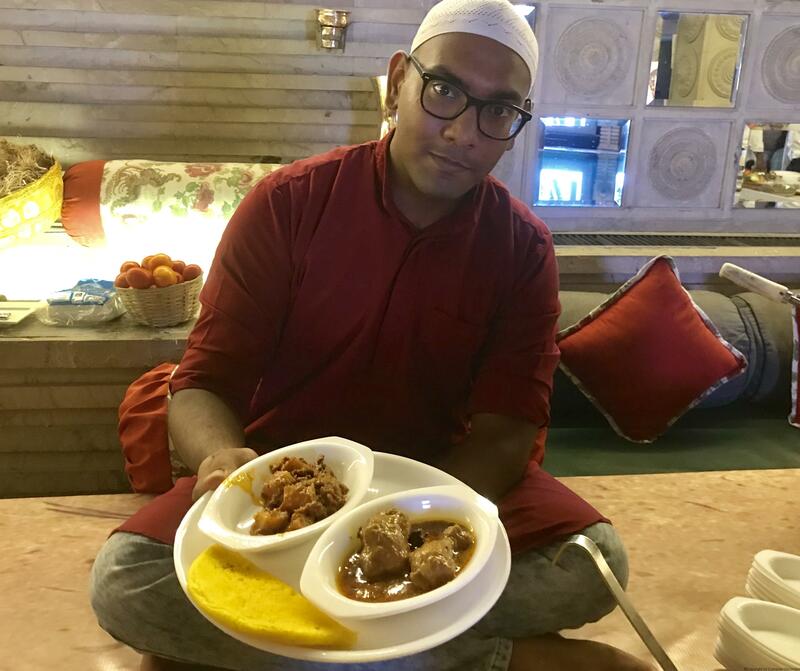 Next Stop: Purani Dilli ki Zaika was also fascinating with its dishes inspired by the iconic Karim’s of Jamma Masjid. There were the famed Mutton Korma and Butter Chicken, of course but what worked best for me was the chicken stew and the aloo kheema along with a variety of sheermal. Lassi of Benares was as it promised, creamy and deliciously thick served in an earthen kulhar. The desserts counter had all the Indian delights, a live counter for crisply-fried fresh and hot jalebis, besides imartis, malpua, the famous Petha (made of lauki) of Agra, Mathura peda etc. Purani Dilli ki Sheermal, Chicken Stew and Aloo Keema toh Khaaya Hoga? There were many dishes left untried, due to lack of space in one;s stomach as well as time, but I made a mental note to definitely try the Chur Chur Naan Thali, (with its different fillings of aloo, gobi, paneer and special mix) and more of the Agra chaat counters, certainly on my next trip. The NH2 food festival is running at Okra in the evenings until December 2nd, Sunday when there is a special Sunday brunch laid out too. 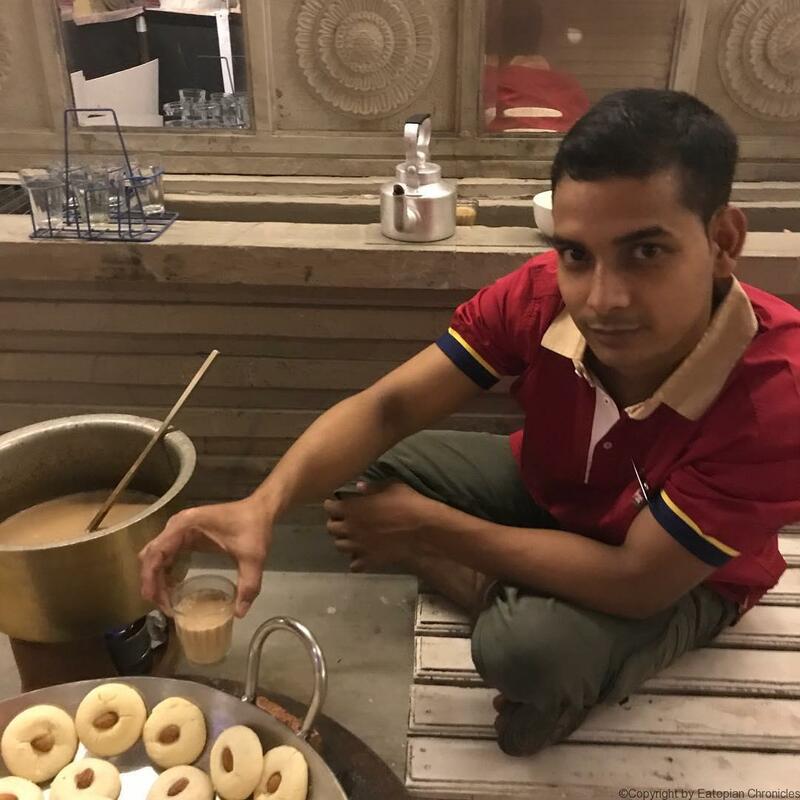 To end it all, there was some lovely masala chai and Naankhatai, old Delhi style and it spelt a blissful stop to all the bingeing one had done! What was commendable about the festival was its sheer magnitude and the attention to detail. Chef Aungshuman and his team deserves kudos for this!